The Easy Poker Timer Texas Holdem Tournament Clock is the easiest way to add fun and excitement to your home poker game. Just like in the casinos, the Easy Poker Timer will show the current Small Blind and Big Blinds, as well as blind level and time remaining for that level. It has a large timer which will show you exactly how much time is left before the blinds go up. Super easy setup needs just four options (tournament length, blind level length, starting chip stack size, and antes). Tournament length can be 2, 3, or 4 hours. Blind level length can be 10 minutes, 15 minutes, or 20 minutes. Starting chip stack size can be $1,500, 2,500, or $5,000. You can also select whether you want to include antes (at the 4th level). Features Simple setupjust choose your options and start the tournamentno need to specify your own big and small blind values. Great for small home Texas Holdem Tournaments. Blinds are automatically calculated based on your tournament needs (tournament length, blind level length, starting chip stack size, and antes). Colorful graphics, with easytoread text. Tournament times from 2 to 4 hours, with chip stacks between $1,500 and $5,000. Check these links to find your download for Easy Poker Timer for & iOS or for your device iPod TouchiPadiPhone. 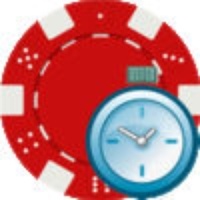 The app Easy Poker Timer is compatible with te following devices.